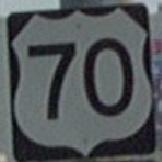 U.S. Federal Route 70 is an east-west highway across Cocke County. It runs from the Cocke/Jefferson County Line, near Danridge, to the Tennessee/North Carolina State Line, near Hot Springs, North Carolina. U.S. Rt. 70 passes through the following towns in Cocke County. U.S. Rt. 70 is multi-plexed in Cocke County. U.S. Rt. 25W, from the Cocke/Jefferson County Line to Newport. Tennessee State Route 9, throughout Cocke County. Tennessee State Route 35, at Newport. U.S. Rt. 25, from Newport to the Tennessee/North Carolina State Line. Tennessee State Route 107, near Del Rio. U.S. Rt. 70 intersects the following highways in Cocke County. Tennessee State Route 35, near Newport. U.S. Rt. 321, at Newport. Tennesee State Route 32, at Newport. Tenneessee State Route 35, at Newport. Tennessee State Route 73, at Newport. Tennessee State Route 340, near West Meyer.